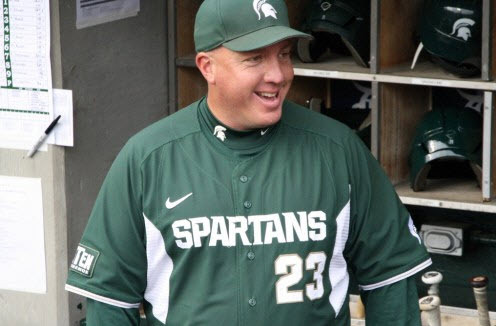 Jake Boss Jr. was appointed the 16th head coach in Michigan State baseball history on July 1, 2008, and has quickly become one of the most successful coaches in the program’s 130-year history. In eight seasons, Boss has compiled a 264-181 (.593) record. His 264 wins are the most over a eight-year span in program history. Five of the 10 winningest seasons in MSU history have come under Boss’ direction. He has guided the Spartans to 30-win seasons in each of the last seven years, as well as the Big Ten regular-season championship in 2011 and the NCAA Tournament in 2012. During Boss’ tenure at Michigan State, MSU has had 26 selections in the Major League Baseball Draft. MSU had four juniors selected in the 2016 draft: Cam Vieaux (sixth round, Pittsburgh), Jordan Zimmerman (seventh round, Los Angeles Angles), Dakota Mekkes (10th round, Chicago Cubs) and Matt Byars (24th round, Minnesota). The year prior, a school-record eight players were taken in 2015: Cam Gibson (fifth round, Detroit), Ryan Krill (ninth round, New York Yankees), Anthony Misiewicz (18th round, Seattle), Cam Vieaux (19th round, Detroit), Jeff Kinley (28th round, Miami), Mick VanVossen (28th round, Washington), Blaise Salter (31st round, Detroit) and Mark Weist (37th round, San Francisco). Under Boss' watch at MSU, players have earned All-Big Ten honors 34 times. Most recently, the Spartans had five all-league selections in 2016, including first-teamers Dan Durkin and Dakota Mekkes; second-teamers Cam Vieaux and Jordan Zimmerman and third-teamer Brandon Hughes. In 2011, a school-record eight Spartans earned All-Big Ten honors. The six first-team All-Big Ten selections in 2011 were the most in program history and featured Player of the Year Jeff Holm, Pitcher of the Year Kurt Wunderlich and Big Ten batting champion Brandon Eckerle. Boss led MSU to its fourth-most wins in program history in 2016, compiling a 36-20 record en route to reaching the semifinals of the Big Ten Tournament. The Spartans posted the best 15-game start in school history, going 14-1 out of the gate. The 2016 season also saw several Spartans garner individual high achievements, including reliever Dakota Mekkes who finished the season as the NCAA leader in Ks per nine innings (15.16) and hits per nine innings (4.11). Zimmerman finished as the Big Ten batting champion, posting a .376 average in league games. Graham Sikes enters his seventh year as an assistant coach for the Michigan State baseball program in 2016-17. He also serves as the program's recruiting coordinator. Sikes primarily works with the Spartan outfielders and hitters while also coordinating the base running program. In his first two seasons on the Spartan staff, Sikes has played an integral role in helping the Spartans win the Big Ten Championship in 2011 and earn a berth in the NCAA Tournament in 2012. Sikes helped tutor a Spartan offense that posted the Big Ten's third-best batting average (.283) in 2016. For the second straight year, MSU also produced a league batting champion as Jordan Zimmerman's .376 average in Big Ten play led all players. Ryan Krill was the 2015 Big Ten batting champ, hitting .451 in league games. Former Spartan team MVP Jordan Keur joined the MSU staff as a volunteer assistant coach in August 2015. Keur started over 150 games and posted a career .315 batting average as four-year letterwinner from 2010-13. As team captain his senior season, Keur led the team with a .337 average and 20 RBI, before tearing his Achilles. Despite the injury, Keur was awarded MSU’s Kirk Gibson Offensive Player of the Year award. An All-Big Ten First Team honoree as a junior, Keur started all 60 games and led MSU to a NCAA Regional appearance. He also paced the Spartans in numerous hitting categories including: batting average (.353), hits (89) and multi-hit games (31). His 89 hits rank as the fourth-highest single-season total in MSU history and ranked second in the conference that year. He was also among the Big Ten leaders in on-base percentage (.432) and runs (47). He finished out the season by being named team MVP and Academic All-Big Ten. Keur played in 53 games as a sophomore in 2011, helping MSU to the Big Ten Championship. Following his playing career, Keur graduated from Michigan State with a bachelor's degree in advertising. He attempted to make a comeback, signing to play professionally for the Washington Wild Things; however, his previous injury prevented him from completing the comeback.